A protein deficiency can lead to several health conditions, including a compromised immune system, chronic fatigue, decreased appetite, blood sugar spikes, and joint pain. 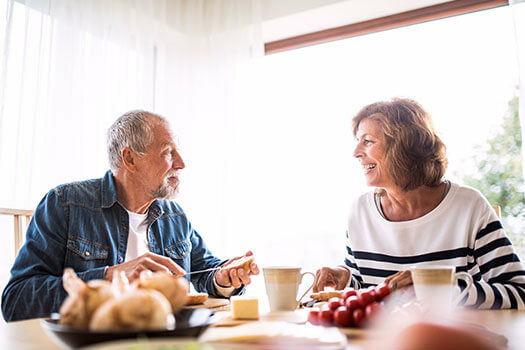 Caregivers need to make sure their aging loved ones are eating plenty of high-protein meals and snacks throughout the day to prevent these health issues. Here is a quick look at five sources of protein that are healthy and tasty. Eggs are one of the most nutrient-dense foods, and there is an incredible amount of protein in both the yolks and whites. There are many ways to incorporate eggs into a senior’s diet, including frying them up for breakfast and hard boiling them to eat as snacks. Eggs are also a great source of cancer-fighting antioxidants such as vitamin C and folate. Eating protein-rich foods is just one of the many ways older adults can boost their health. Seniors can face a variety of challenges as they age, many of which can be mitigated with the help of professional in-home caregivers who provide high-quality home care. Green Valley families trust in Home Care Assistance to help their elderly loved ones age in place safely and comfortably. Not all of your loved one’s protein needs to come from meats and other animal-based products. Beans are very high in fiber, which means their protein content is easy to digest in a short time, and they are also a good ingredient for seniors who are trying to lose a few pounds. Many of the nutrients found in beans prevent the insulin spikes that lead to hunger in between meals. Some of the healthiest beans include lentils, chickpeas, navy beans, and black beans. Many older adults have a difficult time digesting dairy, but those who aren’t affected by lactose should try to have a few servings every week. Low-fat dairy products are packed with protein and other nutrients that can prevent age-related health conditions like osteoporosis and arthritis. Studies are now showing that the probiotics found in certain dairy products are also good for gut health. Before eating any unpasteurized dairy products, your loved one should first speak with his or her doctor about the potential risks. When it comes to protein-rich foods, very few options are as healthy as nuts. A single serving of mixed nuts contains 27 grams of protein and 847 milligrams of potassium. The only drawback of nuts is that many manufacturers add unhealthy seasonings to their products. Buying unseasoned nuts and then dry roasting them is a simple way to enhance their natural flavors without adding sodium or sugar. Almonds are often considered to be the healthiest of all nuts, but your loved one might also enjoy cashews, macadamias, and pistachios. Some seniors need help preparing healthy, protein-rich meals. If your aging loved one needs occasional help with bathing, grooming, cooking, or other basic household tasks, or if you need time to attend to important personal matters, reach out to Home Care Assistance, a leading provider of live-in and respite care. Green Valley seniors can maintain their independence while living at home with the help of our reliable respite caregivers. Turkey meat is flavorful, affordable, easy to cook, and high in protein. Instead of only eating turkey around the holidays, consider picking up a few pounds of this meat whenever your loved one is tired of chicken, pork, and beef. Make sure the turkey meat is free from nitrates or nitrites, as both of those preservatives have been linked to various forms of cancer. Eating protein-rich foods is one of the healthiest habits to adopt. If your elderly loved one needs help maintaining healthy habits, consider hiring a professional caregiver. Green Valley families can rely on Home Care Assistance to provide dedicated and compassionate in-home caregivers who are trained in our holistic Balanced Care Method, which was designed to encourage seniors to exercise often, eat nutritious foods, maintain strong social ties, and focus on other lifestyle factors that promote longevity. To learn about our premier in-home care plans, give us a call at 520-625-2050 today. How Do Calcium Supplements Affect a Senior’s Heart Health?